This displays Statistics on the base of the real time data, with reference to various parameters, like System, Requests, Network, DNS cache, Cache, Cache refresh, Connection- pool, Hosts, Mimes, User and IP addresses. System subsection displays information, about the utilization of system's key resources, by the SafeSquid process. User time: Displays the total amount of CPU time, in seconds, that SafeSquid® has used. User time is CPU time spent executing the user program, rather than in kernel system calls.User time is displayed in HH:MM:SS:ms.
System Time: Total CPU time, in seconds, that is used in making the kernel / system calls to service SafeSquid®. Unit are in HH:MM:SS:ms format. Note: The resource usage statistics depend on a 1:1 thread model. Due to the limitations of the API's used to gather this information, using other thread libraries, may result in inaccurate statistics. Memory resident: The amount of the memory used by memory resident processes of SafeSquid®. These are TSRs i.e. Terminate and stay resident processes. For example, URL Blacklist loads URL Blacklists in the memory and remains in the memory till we shut down SafeSquid®. Details: Memory resident means Permanently in memory. Normally, a computer does not have enough memory, to hold all the programs you use, when you want to run a program. Therefore, the operating system is obliged to free some memory by copying data or programs from main memory to a disk. This process is known as swapping. Certain programs, however, can be marked as being memory resident, which means that the operating system is not permitted to swap them out to a storage device; they will always remain in memory. Memory Shared: The amount of the memory that is occupied by the shared libraries like libstdc++, so3, libpam. This may increase or decrease depending upon Add-on modules or other software that we use in conjunction with SafeSquid®. Details: Shared memory refers to a (typically) large block of Random access memory, that can be accessed by several different central processing units (CPUs) in a multiple-processor computer system. Minor Page fault: Gives the total number of minor page faults, since the startup of the SafeSquid® Processes. Major Page faults: Represents the total number of the Major page faults, since the startup of the SafeSquid® processes. Details: SafeSquid® is a caching proxy. It may have to look inside the cache to serve contents and also some time to serve templates. Similarly, SafeSquid® generates logs. SafeSquid® also could be invoking other applications.So SafeSquid® performs a lot of memory swapping and disk i/o. The Statistics page displays the various aspects of this activity as minor and major page faults, besides any errors if they occur. An interrupt occurs when a program requests data that is not currently in real memory. The interrupt triggers the operating system to fetch the data from a virtual memory and load it into RAM. An invalid page fault or page fault error occurs when the operating system cannot find the data in virtual memory. This usually happens when the virtual memory area, or the table that maps virtual addresses to real addresses, becomes corrupt. Minor Page faults are number of hard page faults (i.e. those required i/o). Major Page Faults are the number of times a process was swapped out of physical memory. Requests Requests subsection gives information on total number of HTTP, FTP and CONNECT requests fulfilled, since the last startup of the SafeSquid® processes.This quickly tells you about the different protocols being serviced through your proxy server. Network For administrators it is very important to know what is the amount of data that has been throughput. Network subsection gives information on Total Successful connections, Failed connections, DNS failures and Total Bytes transferred in/out of the network, since the latest startup of the SafeSquid® Processes. 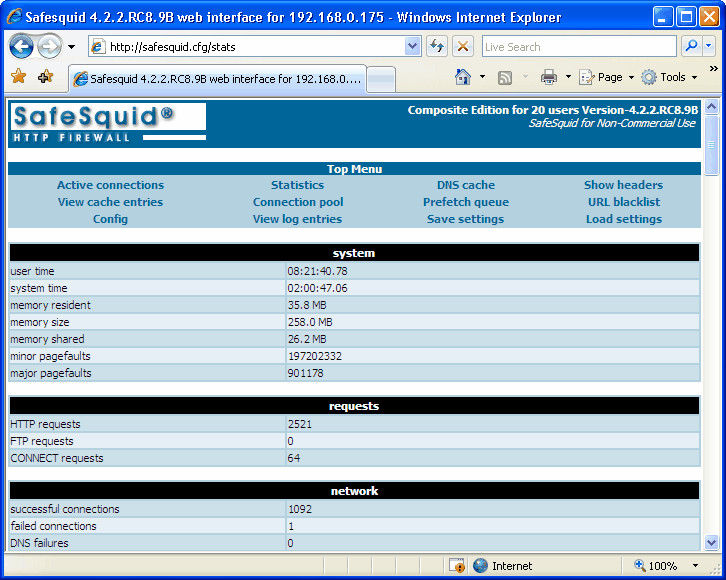 This helps you to set various parameters in SafeSquid® and System's Network settings to have improved performance. For example if you see too many DNS failures, you may need a better connectivity to your DNS servers. Similarly if you see too many failed connections and your logs say that they were genuine requests then it means that either your network is saturated or you need better ISP. DNS Cache When a request is made, its web server address is resolved from DNS Servers. SafeSquid® has a DNS cache to store these resolved addresses for future use. This can dramatically reduce the latency. This section gives total number of Hit Ratio and Miss Ratio. A HIT means that the document was found in the DNS cache. A MISS, that it was not found in the DNS cache. Cache This section gives total number of Hit Ratio and Miss Ratio of the Cache. A HIT means that the requested content was found in the cache. A MISS, that it was not found in the cache. Cache Refresh You can configure SafeSquid® to revalidate the cached content after defined interval. If need be, SafeSquid® refreshes the content and serves the relevant content to the clients, depending on the various parameters you set in the 'Cache' section. Quite a few times, SafeSquid® could discover that the validity of the cached content was obsolete. This is recorded as miss in the Cache Refresh subsection. Connection Pool Connection Pool shows the number of times a connection was available to the request and the number of times it had to create a new connection for a particular request. The number of times it found the connection in the connection pool it is a hit and the number of times proxy had to establish a new connection it is considered as a miss. Hosts This section shows the sites that are most frequently accessed by users, and the number of requests for a particular host along with its usage percentage. Mimes Mimes subsection display Mime types being accessed, and the usage percentage of the same. Users Users subsection displays users and their respective usage percentage, of the Proxy Services. If authentication is enabled, the users section would display usernames and the number of requests they have made, otherwise it will display anonymous. IP Addresses IP Address of the machines that have made requests, along with their respective usage percentage.